An adult pool party can be every bit as fun as one for kids. The most fun is when we have guests who enjoy being in the pool as much as we do. But, we've also had some gala affairs and birthday BBQ's with tables set up all around the pool. 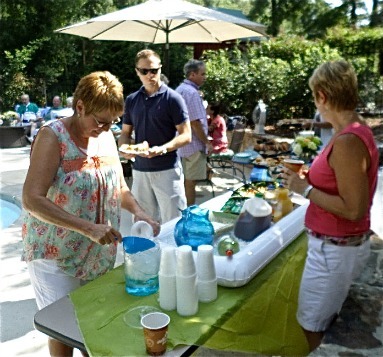 You can't have a pool party without food and drinks and keeping them cold and easy to serve is key. That's why you'll find this inflatable salad bar works to keep anything cold. Inflate, fill with ice, and set salads, appetizers or drinks on the ice. When the party is over simply drain the melted ice and deflate. It's easy to store for the next party. A rolling beverage cooler makes it easy to keep drinks cold, for guests to serve themselves and to move it wherever it's most accessible. 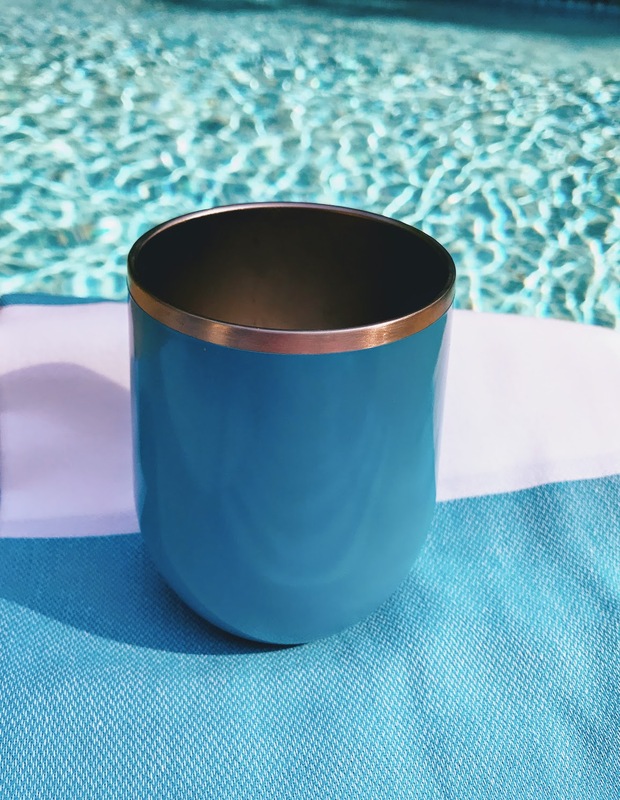 Keep these stainless steel double wall vacuum insulated stemless wine tumblers in the fridge and then serve your favorite cold wine out by the pool to keep your drinks nice and cold even on the hottest day. The set of two comes in a variety of colors but my favorite is the aqua. It's top rack dishwasher safe too and 100% BPA-free. 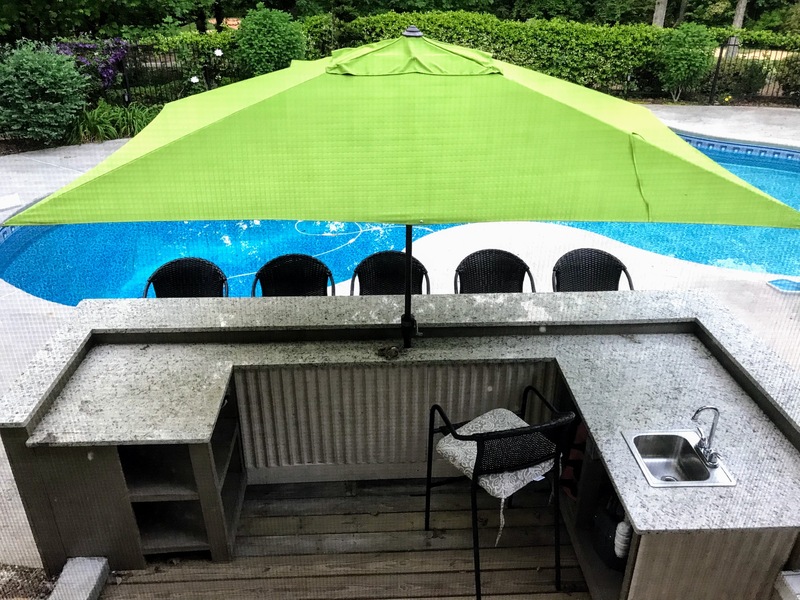 Our outdoor kitchen and bar area is a great place to hang out anytime of day or evening. 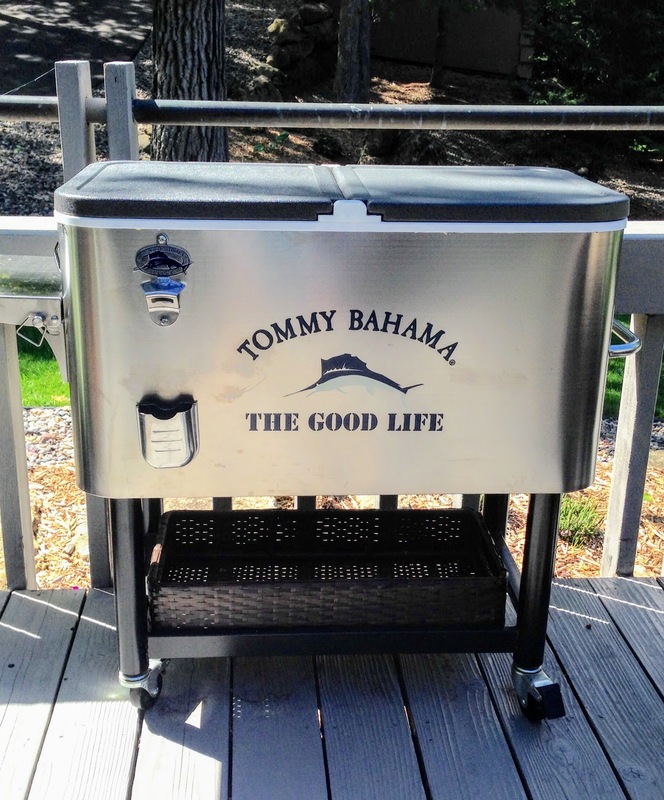 With a stocked outdoor refrigerator and small sink with hot and cold water, it's well equipped for entertaining. If you don't have the space, time, or talent for a full scale bar area you can just get a set for something instant. Create your own instant outdoor bar furniture patio set for you and your guests. Pool party themes are not just for kids. 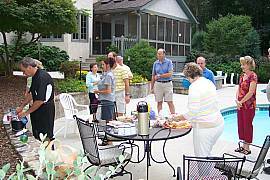 We've hosted many adult pool parties with themes - like a beach party, flip flop party and a Hawaiian or Luau theme. Having a theme makes planning easier - from the invitations to the pool party decorations. A theme also adds to a more festive atmosphere and for opportunities to to be more creative with games, food and party favors. 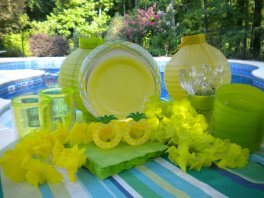 Looking for an idea for a pool party theme? A summer garden party makes for a great pool party theme, especially if your landscaping includes lots of colorful perennials or annuals. Our neighborhood ladies loved the perennial exchange and the colorful bouquets of hydrangeas that adorned the party tables. Get out the pink - fuschia pink that is and have fun with this flamingo themed girls pool party. 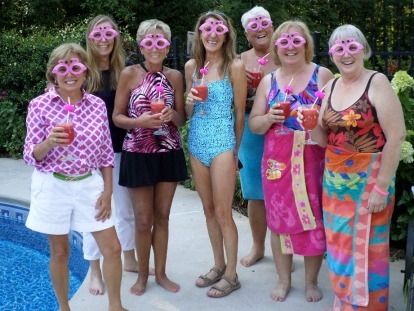 Pink watermelon coolers, pink beach balls, flamingo straws, foam glasses, and flamingo floats made for lots of fun as this group of friends got together to flamingle. Stainless steel wine glasses are not only unbreakable, but put them in your fridge or freezer first to keep your white wine nice and cold even on a hot day. You can also freeze the glasses for a couple of hours and use them for sangria or ice wine. Dishwasher safe for easy clean up. Get them in a set of 2 or 4 for classy outdoor entertaining. Acrylic wine glasses that feel and look like glass but far more durable than any other plain glass or plastic drinkware. Use these wine glasses for indoor use as well. They are 100% DISHWASHER SAFE. The premium Tritan material is BPA-free, BPS, EA and AA-free, which means the glasses don't have toxic chemicals and can withstand hundreds of washing cycles and falls. Each glass is clear, odorless, and undergoes 3rd party testing so that maximum quality and safety is guaranteed. 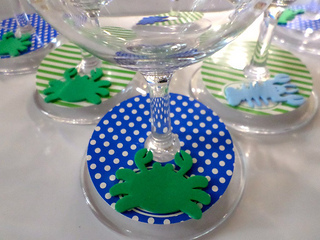 Don't you just love the bright colors of these wine glass stem tags? Found the tags at Target and then used beach themed foam stickers rather than names. People often don't take the time to write their name on the tag, so by having a unique sticker they can remember which glass is theirs. Even though I have many wine charms, what I don't like about them is that they are so small and with aging eyes it can be hard to distinguish the difference between them. It is amazing the difference in comfort a fan can make. We have lots of portable battery operated fans that can clip on umbrella poles and sit on a table and oscillate. These fans can also help keep flies, gnats and mosquitoes away when set on high. 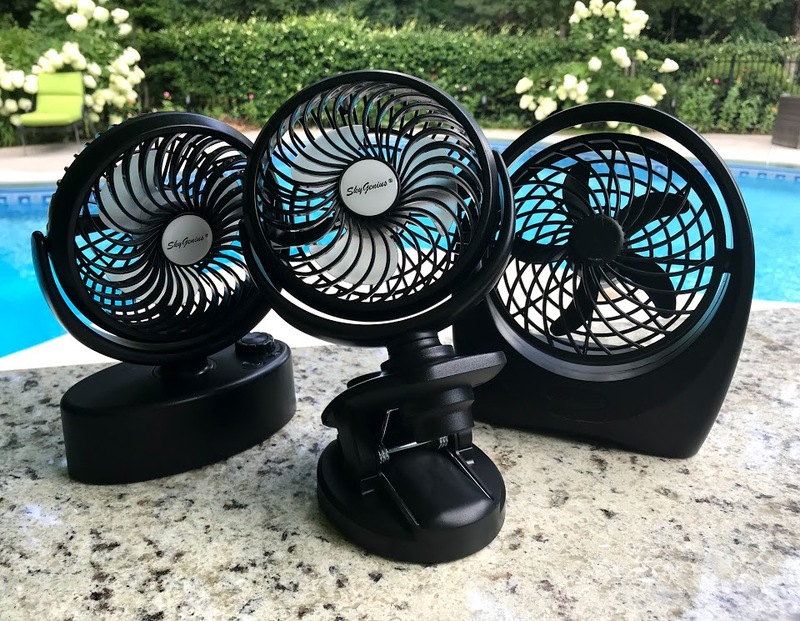 Don't let the heat keep you inside when you can stay cool by the pool with a little help from portable battery operated fans. Background music can bring back fond high school memories or provide atmosphere to your adult pool party. Whether it's Hawaiian music for a luau party or the Beach Boys for a beach themed party, be sure to include making a playlist in your party plans. We love our Brookstone Outdoor Speaker. It has a 150' range . The universal docking system will play music on your iPhone, iPad, iPod, Kindle Fire or other smart phone device. It will also connect to your stereo system and transmit music wirelessly to the speaker. Brookstone has updated their outdoor wireless speakers to an improved version with 4 speakers that deliver 360 degree sound. The rechargeable battery can go up to 4.5 hours. It is designed to be weather-resistant and waterproof for outdoor use. 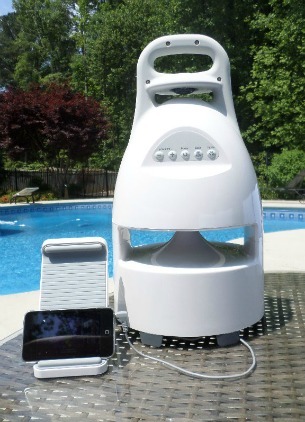 This outdoor party speaker pairs wirelessly to Bluetooth devices up to 33' away. Adult pool party games can be in or out of the pool. For those who enjoy getting wet, a simple form of entertainment is pool volleyball or, in our case, we love to play pool badminton. We set up a volleyball net across the shallow end of the pool and buy a badmitton set. Usually we buy an inexpensive set since it usually only lasts a season since we get the rackets wet. Four people (two on each team) can play at a time and we rotate out the two who have lost the last game. A limbo game is great to play out by the pool. Put on some limbo music and start the fun. Everyone takes a turn going under the limbo stick without touching it - if he does, he is out. Keep playing until there is only one person left who should be rewarded with a grand prize. 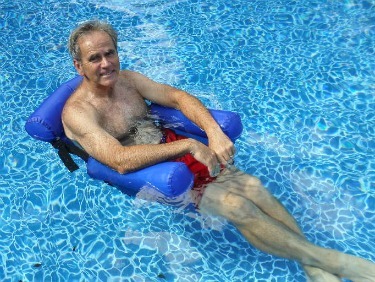 The best swimming pool floats for adults are swimming pool chairs with a beverage holder. Of course you need more than one - we always have two of them. While lying flat on an air mattress is good for relaxing, it's not great for catching up with the other guests. A pool chair float makes it easier to have a conversation with another adult. 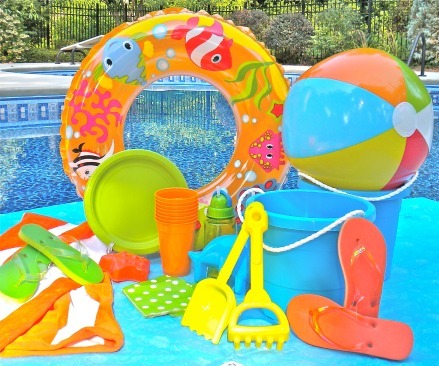 Whether you use fun floats or lighted pool fountains, pool decorations can set the tone for a fun party time. 3. 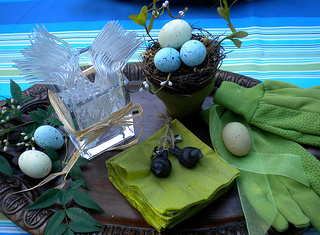 Decorate the the party tables with a coordinated color scheme. Frozen alcohol drinks with a tropical theme like a pina colada topped with a fresh slice of pineapple or strawberry makes for a refreshing beverage. 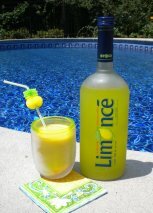 Many of these drinks can be made without the alcohol for a frozen virgin drink. Easy to prepare with simple ingredients, you'll be ready for any spontaneous or planned adult entertaining.